Extra-large balcony runs the full length of condo with unobstructed city views that go on forever! Gas barbeque hook-up for al fresco dining with friends and family! Ownership of 1 underground parking spot and storage locker! Great pied-a-terre, investor's opportunity or affordable condo for professionals / executive couples! Expansive living room layout is ideal for entertaining **. Exposed concrete walls and ceiling,** bathed in natural light all year long from the wall to wall windowswith sliding glass doors that lead out to the balcony. Feels much larger than it is ! Sleek Scavolini kitchen! Stainless steel appliances include a "must have" gas stove. Glass tiled backsplash, stone counters and ample cupboard and counter space including a built-in breakfast bar for casual dining. The den is currently being used as a dining room overlooking the kitchen for ease of catering to all your guests! Use the space to whatever suits your individual needs. Gracious master bedroom! Floor to ceiling windows, frosted glass door divider, double closet anda 4-piece luxurious en-suite bath! The 2 spa-inspired 4 piece baths comewith rainhead showers, custom vanities, deep soaker style tubs with a glass partition wall. Ensuite laundry with a front loading washer/dryer! Lots of closet space throughout. Pristine engineered wood flooring throughout. 318 King Street East offers convenient access to Toronto's business & entertainment districts popular with young professionals! With a WalkScore of 97/100, the world is your oyster to discover on foot! 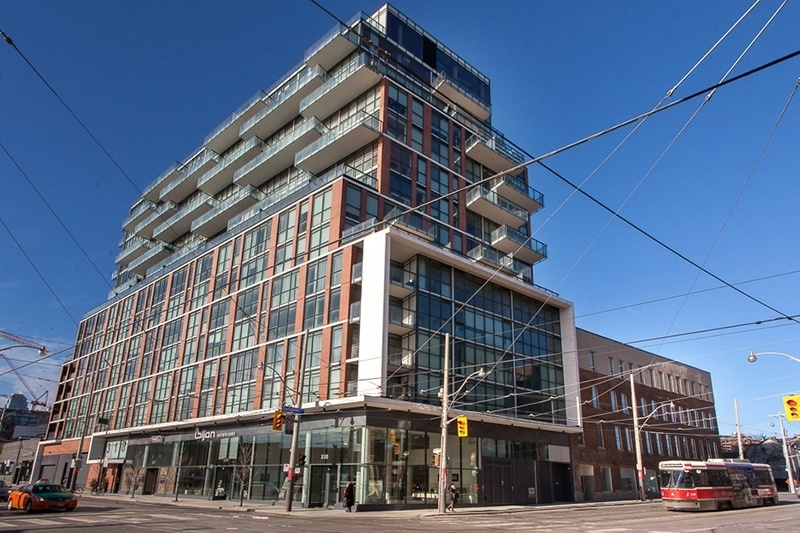 Situated around the corner from one of Toronto's most popular landmarks The St. Lawrence Market! Home to over 200 food vendors , frequented by tourists and locals alike. The market was founded in 1803 and was recently ranked by National Geographic as one of the best food markets in the world. This upscale Corktown neighbourhood has a flourishing, classy nightlife with hip restaurants, galleries, bars & lounges in the Distillery District,King & Queen Street. Lots of local shopping available on King, Sherbourne, Parliament & Queen Street East where you will find an eclectic mix of local stores, design and decorating stores that draw shoppers from all over Toronto. Plenty of parks surround! St James Park, David Crombie Park a multi-faceted linear park that runs through the centre of the St. Lawrence neighbourhood along The Esplanade. This park includes pretty strolling & sitting gardens, a waterfall, a handball court, and a basketball court. The Sackville playground located along King Street East has a tot park, basketball court & a wading pool. The St. Lawrence Community Centre on the Esplanade includes squash courts, a swimming pool, gymnasium, piano room, weight room & games room. Go Green! Walkscore.com rates it a 98/100 for ease of public transportation. World-class transit at your door ! The Queen and King streetcars connect to stations on the Yonge-University-Spadina subway line , while the Parliament streetcar connects passengers to the Castle Frank station on the Bloor-Danforth subway line. Union Station is within walking distance as well. Motorists are only a few minutes from the Adelaide Street on-ramp to the Don Valley Parkway, and an equally short distance to the Gardiner Expressway and Lake Shore Boulevard. The King East redefines modern design on one of the most historically significant corners of the original 10 blocks of the City of Toronto - King and Parliament . This uber modern condominium is Hyde Park's second loft project with Lamb Development Corp.Completed March 29, 2013 with a total of 215 suites just 15 stories high. Building amenities include: Concierge, party/meeting room, guest suites, visitor parking, security system, (barbeques allowed). 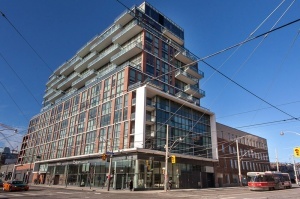 Superior location just a short stroll to the distillery district, waterfront and a 15 min walk to the financial core! 318 King offers easy access to the Gardiner/DVP and is situated in a thriving location which is going through a major revitalization with many area improvements and upgrades due to the Toronto 2015 summer Pan Am and Parapan American Games. 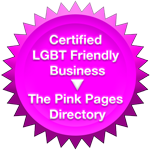 Check out http://www.toronto2015.org for all the dates, events and venues.